In less than a week my wife and I become empty nesters. Emotionally, I’m not sure how I’ll deal with this rapidly approaching and inescapable reality. I tend towards being an emotional mushball anyway, so I am looking forward to the moment when I drive away from the college campus leaving my daughter a continent away from home with something less than joy. We decided together to make this transcontinental trip to college a family vacation, potentially our last vacation together as a family in its current make-up. We took two weeks off from work and began the drive from Illinois to California, stopping to visit some national parks along the way. What a beautiful country. God most surely dwells in the American Southwest. The apex of our vacation was the Grand Canyon. Ever since our children were born my wife has wanted to take them there. Being overseas missionaries our time in the US was always limited, so long leisurely vacations in America were a rarity. But this was a special time. We now live in America, we have a nice comfortable, fuel efficient car, and we had to go California to drop our daughter off at college. This was the first and likely the last time to do the family vacation to the Grand Canyon about which my wife had been dreaming. We left our hotel early yesterday morning to begin the three-hour drive from St. George, Utah to the North Rim of the Grand Canyon. Ninety percent of the Grand Canyon’s visitors go to the South Rim, but a quick visit to the Canyon via Google Earth had shown us the perfect place on the North Rim from which to view the canyon: a long, frighteningly narrow natural walkway that jutted out into the canyon like a lonely hair on a bald man’s head. We guessed that the view from that long, narrow, lonely, jutting ridge would be spectacular. 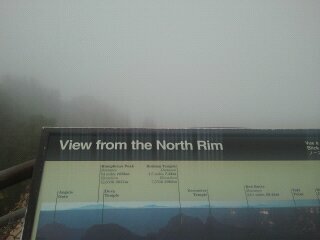 We got to the park entrance, paid the $25 entrance fee, and laughed at the sign that said “No refunds for poor visibility.” As we drove into the park we saw low clouds, clouds which encroached lower and lower the closer we got to the canyon itself. When we arrived at the canyon’s edge, to the very place we had chosen earlier to be our vantage point, at what was to have been the high point of our last family vacation together, visibility was about a hundred feet. We could have gotten the exact same view on a cold, drizzly day in March back in Illinois. Having paid the $25 to see nothing did not bother me. What left the hollow feeling in my stomach and pain in my heart was that this was the vacation moment my wife had dreamed of ever since our son was born over 20 years ago, and there we were with nothing to see. What filled my soul with sorrow was that this was our last family vacation of this type, the vacation moment we had longed for and talked about and planned for but which turned out to be nothing but $25 fog. Feeling cheated does not begin to express how I felt. Like opening a present at Christmas, the fog began to unwrap itself from the canyon. An open patch in the clouds here, a bursting ray of sunlight there, a gust of fog-lifting wind all around us and little by little, piece by piece, fragment by fragment, the canyon was revealed. “Look over there, I can see a cliff. Wow, look through that open patch, cool, I can see the canyon floor – that is beautiful.” As on the first day of creation, God seemed to be making the Grand Canyon fresh, new, just for us. The magnificent canyon appeared out of nowhere with each new breathtaking scene being revealed one at a time as the fog disappeared. Each vista was new. Each vista was unique. Each vista was set in its own wispy frame. The lifting of the foggy curtain allowed the show to begin. My anger at God and my disappointment were transformed into joy and gratitude. God had chosen to awe us with a grand unveiling. He had placed us in the park on that day in those conditions so that he could lift the curtain on what he had made. He had given us the privilege of watching him joyfully and excitedly open the curtain on what surely must be the most spectacular “show and tell” of all time. I still don’t understand prayer; I probably never will, but I think I understand God at least a wee bit better. I think I just experienced God proudly, excitedly, breathlessly and with a bit of divine showmanship say, “Look at what I made. Isn’t it beautiful?” I believe he was pleased with my reaction.